The swirl of claims about the health benefits of teas and herbals seems never-ending. How do you sort it all out? The best way to start is to consider the source. While the Internet has made access to good information even easier, it has also made fraudulent and just plain wrong information equally accessible. You have to be more vigilant than ever in separating one from the other. Add to that the convoluted language used on many medical sites, and you can see why more plain English versions abound. But are they real or made up? Often, it is hard to tell. One thing I know for sure: Some brief article written as a fluff filler piece on a site that focuses on news and politics is not a good source of information about any health claims, whether related to tea, herbal infusions (aka, tisanes), or other substances. I have learned over the years to take this things at arm’s length or ignore them altogether. A better source, at least for some straight thinking about the issue of tea and health, is a tea blog like this one where the authors have looked at the details, not just at the glossy fluff filler piece. A great article popped up recently addressing the cringe-inspiring Dr. Oz. I have wanted to write something here about him, too, but can’t bring myself to watch him at all, so bravo to Nicole Martin for at least being able to stomach him enough to know how bad he is. Getting back to that latest tea health claim tidbit spreading like wildfire online, just pass it by and go to a reputable source. thank you for this post!.. 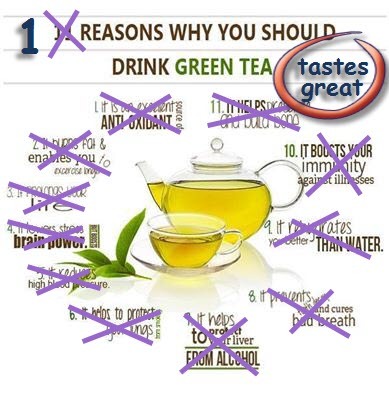 and i agree with you …i always wonder if there is really that many more antioxidants and health values in green tea, versus black tea … i personally think that its just a way to promote green tea .. i expect that FRESH tea leaves would be better than dried tea leaves, if we could only grow our own tea bushes!… but considering that both black tea leaves and green tea leaves are already dried, then it doesnt really seem that there would be all that much difference between the two, black or green … … but i do know that i prefer to use FRESH herbs for cooking (rosemary, thyme etc) as compared to bottled dried cooking herbs, but since i cant grow tea bushes in my yard due to the climate, i have to use dried tea leaves …so about the only thing that we can do is try to buy our black or green teas from a source that ships out the freshest dried teas that we can find … .. and so hopefully by obtaining the freshest teas we can find, we will be able to get those antioxidants .. I know of a few folks in California growing tea plants. They seem to be doing well. You might give it a go. Could be good.